When I Coloured in The World is one of ten books from around the world that really wowed Laura Taylor! 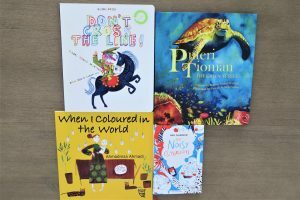 We are thrilled that our brilliant picture book When I Coloured in the World has appeared in Kid’s Book Review as one of their ‘Ten Fabulous Reads from Around the World’! Read the wonderful review below! A child sets about transforming the world with a simple box of crayons, an eraser . . . and a healthy dose of imagination and creativity. In a story that combines vibrant illustrations and simple poetic text, boredom becomes children playing under a blue sky; drought becomes big silver drops of rain and beautiful umbrellas; hunger is transformed into a lush green field of wheat. This is an uplifting book, full of hope, joy, beauty and peace. A copy of When I Coloured in The World was sent to the Home Secretary! How When I Coloured in The World was used in a primary school!